We offer a wide range of extra-curricular activities complementary to our core Montessori curriculum. The extra-curricular activities take place on our premises on Wednesdays from 8.30 to 6.30 pm. These activities are meant for children’s school only. Our yoga activity is specially designed for children. The class alternates postures, relaxation exercises based on breathing, games and improvisations. This harmonizes the child’s sensorial energies and brings inner calm. Musical activities are designed for very young children, between 3 and 5 years old. The objective is to develop their musical sensibility through various activities. Through songs from a traditional repertoire, children have the opportunity to work on articulation, memorization and interpretation. In each course, the rhythmic work is done with sensorial materials, different music styles and body movements. Theatre activities are designed for children aged 3 to 6 years old. Each session consists of group games introducing basic theatre techniques and improvisations. Each workshop begins with breathing exercises, body language activities and work in space. Through improvisation, children learn to present themselves to others, to be seen and heard. Cet atelier est ouvert pour les enfants de 2 à 6 ans. Il permet aux enfants de découvrir d’une manière artistique et ludique le pouvoir de la création tactile. With real cooking equipment and fun recipes, children will discover the joys of cooking by learning to make their own pastry masterpieces (madeleines, cupcakes, muffins, pancakes, etc..). At the end of the workshop the children will have the opportunity to enjoy their cooking together as they share a snack. 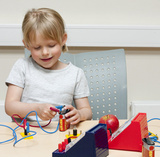 Our workshop Beautiful Minds offers children a fun and exciting introduction to the sciences. During the workshop, the young researchers conduct their own experiments with scientific and educational materials. The workshop is conducted by the host scientist who encourages children to observe and describe phenomena and suggest explanations. The scientific method tests hypotheses by conducting experiments and observing the results. This scientific approach develops children’s critical thinking ability and is very useful in everyday life. Children are encouraged to develop their thinking, their argumentation and reasoning with pleasure and curiosity.